While working on this project I discovered that my new 2012 Ford F-150 has a sophisticated battery management system. It has Hall effect current sensors on both the alternator and battery negative lead and it monitors the battery voltage. It tracks state-of-charge of the battery in real time. If the battery SOC gets too low, it starts turning off accessories. If it gets to the threshold where the engine might not crank, it turns everything off. 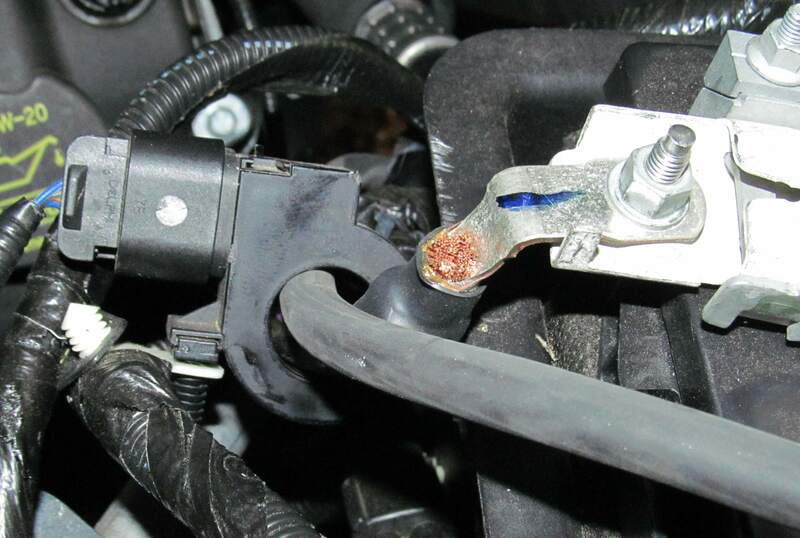 Realizing that this sensor could be of considerable use for both EV and RV applications as well as my Cordless Battery Charger, I decided to investigate the sensor on the battery negative lead. Here is a photo of that sensor. I could not find much information on the web about the sensor so I decided to drag the ole Rigol scope out there and take a look. 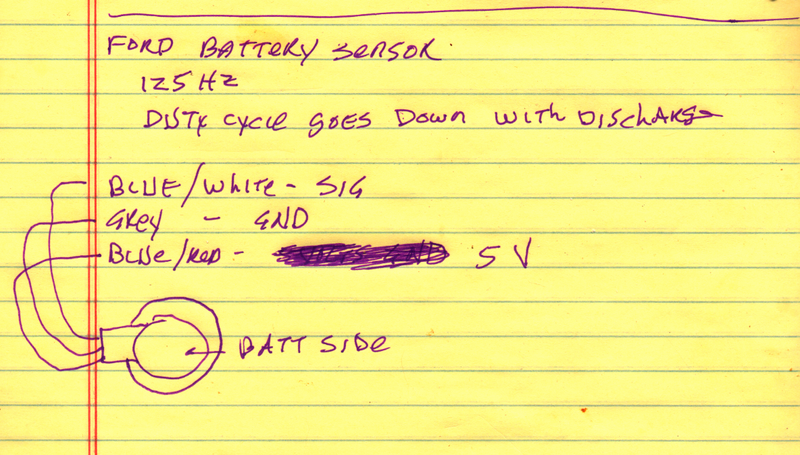 Here are my notes from probing the sensor with my scope. The output of the sensor is a 125 hz carrier wave that is pulse width modulated according to the current flowing through the conductor(s) in its hole. At zero current, the signal is a symmetrical square wave. As you'll see below, the width varies proportional to the current going both ways. This shows the output with no current flowing. My apologies for the somewhat blurry images but my scope and my camera don't get along very well. This is the output during engine cranking. This shows the charging current right after engine start. This truck has a 150 amp (I think, may be larger) alternator. I later ran the battery down considerably and the charging signal was almost as narrow as the cranking one. Opposite polarity, of course. This shows the signal with the engine off but with every accessory turned on. This shows the waveform with the engine off but with the 2000 watt inverter connected to an 1850 watt load. The battery voltage dropped to 11.6 volts with that load so that is 1850/11.6 = 160 amps. Probably closer to 170 or 175 amps when the inverter inefficiency is figured in. This is the inverter face with the 1850 watt heater load. If you look carefully at the bargraph, you can see 6 bars fully lit and the 7th bar starting to come on. That's reasonable since this inverter can surge 4000 for motor starting. I spent quite a bit of time looking around trying to find a price for this sensor. None of the online car parts stores that I checked with had it. Then I found someone selling a large quantity of them on Sleazebay for $7.99 ea. Sounds reasonable to me. It looks like this sensor peaks out at about 200, maybe 250 amps. I feel confident that there are larger range sensors on Ford's larger trucks, especially their diesel models. I noticed in my search that several GM vehicles have a similar system with the same type of sensor. 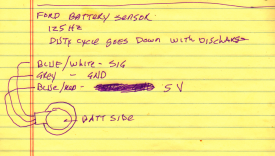 GM sensors have traditionally output a 0-5 volt DC signal so they may be handy to use in certain circumstances. Not having anything GM, I don't know for sure. In summary, this could be a very handy sensor for a variety of projects.